Cate Blanchett tends to be at her reed carpet best when she wears unexpected pieces. She was on the red carpet for the 'Thor: Ragnarok' premiere last night(October 10th) at the El Capitan Theatre in LA. 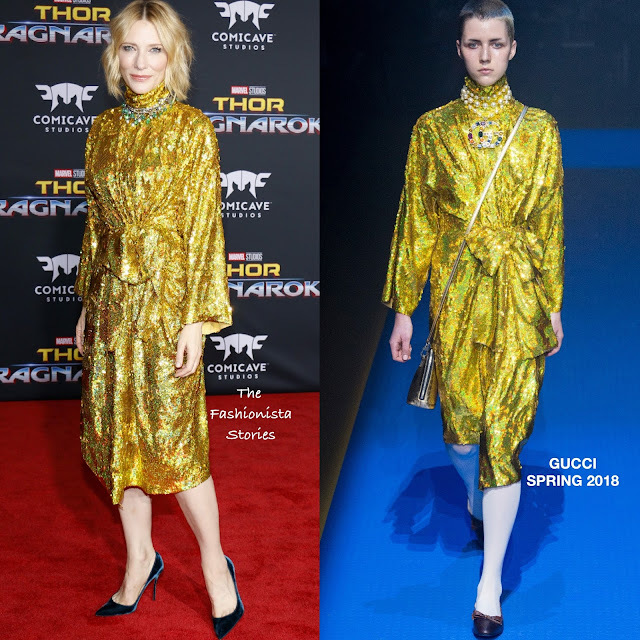 Making a shining entrance, she wore a GUCCI SPRING 2018 long sleeve gold, iridescent sequin dress with a high neckline and a bow detail waist. Cate could have easily gone with black pumps but instead she wore navy velvet. I kinda wish she wore her hair pulled back, in an up-do but I think the dress works for her. Are you sold on Cate's shining look?